Save $25 on a Stainless Steel Chugger Pump with this More Beer Coupon Code! 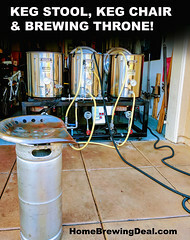 Coupon Description: Today at MoreBeer.com, there is a promo code that will save you $25 on a Stainless Steel Chugger Homebrewing Pump. 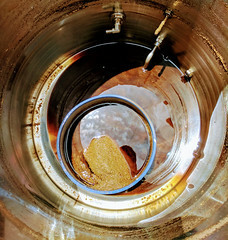 Homebrewing pumps are a great way to speed up your home brewing process and make better beer! The Chugger home brewing pump is a great value for an even better price. 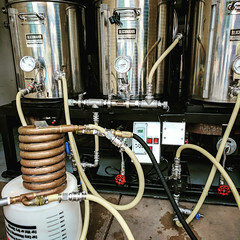 These home brewing pumps are workhorses in the brewery and feature a robust flow rate of 7 gpm and a magnetic drive designed to handle back-pressure! These stainless home brewing pumps are a great addition to any brewing setup! The Stainless Steel Chugger Pump features a molded Stainless Steel Pump Head. This stainless pump is a steal for the price and can be used to ease transfers between kettles, cool wort via a counterflow chiller, or recirculate icewater for quicker chilling! The Chugger pump has 1/2″ mpt inlet and outlet, allowing easy configuration for any application! We recommend setting these pumps up with a Ball valve on the outflow side, this way you can throttle down the outgoing flow rate, allowing for more efficient sparges or cooling! If you have been considering adding a home brewing pump to your home brewing setup, this is a great time to do so! Plus you get free shipping from MoreBeer! Here are some of the features on this stainless steel chugger home brewing pump! 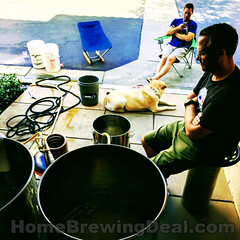 Save 10% On March Home Brewing Pumps – March Madness Homebrew Sale at MoreBeer! Coupon Description: Right now at MoreBeer you can pick up a brand spanking new stainless steel home brewing pump and save $25 and get free shupping! This is a limited time and quantity deal of the day! The Chugger lineup of stainless steel homebrew pumps represents a great value for an even better price. These pumps are workhorses in a home brewery. They feature a strong flow rate of 7 gpm, and a magnetic drive designed to handle back-pressure, these pumps are a great addition to any brewing setup! The Stainless Steel Chugger pump showcases their molded Stainless Steel Pump Head. This stainless steel pump is a steal for the price! Use this to ease transfers between kettles, cool wort via a counterflow chiller, or recirculate icewater for quicker chilling! The Chugger homebrewing pump has 1/2″ mpt inlet and outlet, allowing easy configuration for any application! Set these pumps up with a Ball valve on the outflow side, this way you can throttle down the outgoing flow rate, allowing for more efficient sparges or cooling! The pump head can also be rotated 360° allowing for even more customization!